To celebrate the "Aphrodite the Beauty" Swag Bag Contest, here is my review of the first book in the Goddess Girls series!! Don't forget to enter the contest! The first installment in the Goddess Girls books is a great introduction to the series. The reader is introduced to the school at Mt. Olympus at the same time that Athena first sees it. We are thrust into this brand new world of immortality and magic just like Athena is. The book has a great message for girls about dealing with mean girls and also how to deal with boys. I loved Athena's attitude towards the cocky Poseidon as she realizes he's not so crush-worthy after all. 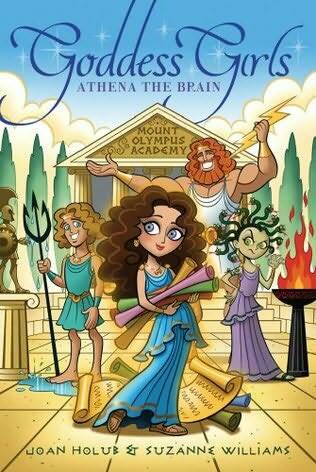 Book lovers will love Athena's brainy personality, and how she's always carrying around tons of scrolls (books). Her relationship with her dad, Zeus, is played out with love and comedy. The only reason I marked this one 4.5 stars instead of 5 is because I really liked books 2 and 3 a lot better than this one. But sometimes that's what happens in the first book of a series, because the world has to be set up and introductions to the characters need to be made. The covers of these books are fantastic. The bright colors and cartoony girls are so eye-catching, but the beauty is really in the details. Each cover has many small elements from the book that are woven into the picture. It's so fun to see Persephone's missing ball of yarn or Athena's pile of homework scrolls that she's never seen without. It's so nice to see a cover where the artist has clearly read the book instead of using a stock photo. Bottom Line: This is another great installment of the Goddess Girls series, fun, sweet stories for girls with a fantastic message! You tempt me and tempt me!!! and I agree on what you say about covers! and they are lovely. My daughter would love this book, what age group is it aimed for do you think? Julia, Amazon has the book listed as ages 9-12. The girls are 12 in the books. I hope this helps! These sound so cute and positive :D Great review! Carrie! Thank you so much for your thoughtful review of Athena the Brain. It seems like so long ago that Suzanne and I wrote this one! #4 Artemis the Brave releases in December. And we're currently working on #6 for 2011. Our Aladdin editor loves Zeus. She said he reminds her a bit of her own dad. Hi Joan! I can't wait to read Artemis, and I'm so excited there will be 5th and 6th books too! That is great that your editor is reminded of her own dad with Zeus! Glen Hanson did a fantastic job with the covers! I love all the little details. I checked out his website and I had actually seen some of his other work before! Let me just chime in with thanks for your lovely and thoughtful reviews, Carrie. Joan and I are having a lot of fun with this series. It's the first time we've ever written something together and we're finding out what a blast that can be! I LOVE THE GODDESS GIRLS SERIES!!!!!!!!!!!!!!!! I'm reading this book,the 1st one Athena the Brain 4 my "Reader respose" blog 4 my HW! LOVE THE SERIES!!!!!!!!!!!!!! KEEP UP THE AWESOME BLOGS!! !